I don’t know about you all, but this week I start another school year. I’m so excited. I’m at a new school this year, so I’ve been spending the past few weeks getting my classroom all set up in my new space. I have been preparing my student work space, my desk, my teaching area, my small group stations – everything is in preparation mode so that I can kick this new year off right. Which is why I have also been prepping my classroom for ClassMax this year. Last year, I used a ClassMax prototype I was testing and while it was really helpful and better than nothing, it didn’t have nearly the features and efficiency of the polished ClassMax that we will launch on September 5. In order to maximize my classroom success, I made a big change to how I will collect student information this year so that it makes setting up my ClassMax classes a lot easier. For ClassMax, you can manually load your students in one at a time or you can use our csv template and upload whole classes at a time. The template is pretty straight forward and consists of collecting the student’s name, any categories they might fall into for data analysis (free/reduced lunch, ESE, gifted, etc. ), parent name, parent phone number, state test score, Lexile, and parent email. These categories correspond with the information stored in the student profile. I am going to love having all this student information at my fingertips once the year starts, but inputting all that data was going to really be a drag. I decided instead that I would have parents input their data using a Google form. The form drops the data into a spreadsheet that I can use to copy and paste columns straight into this csv file. If you want a copy of my Google form, here it is. Just make a copy for yourself, customize to your class specifications, and you are good to go. Now, keep in mind that you will need to sort your Google Sheet by class period and then upload to ClassMax. You can only upload one class at a time. But using this form will at least get the MAJORITY of your students in a spreadsheet that you can then manipulate however you need. Not at a digital school? 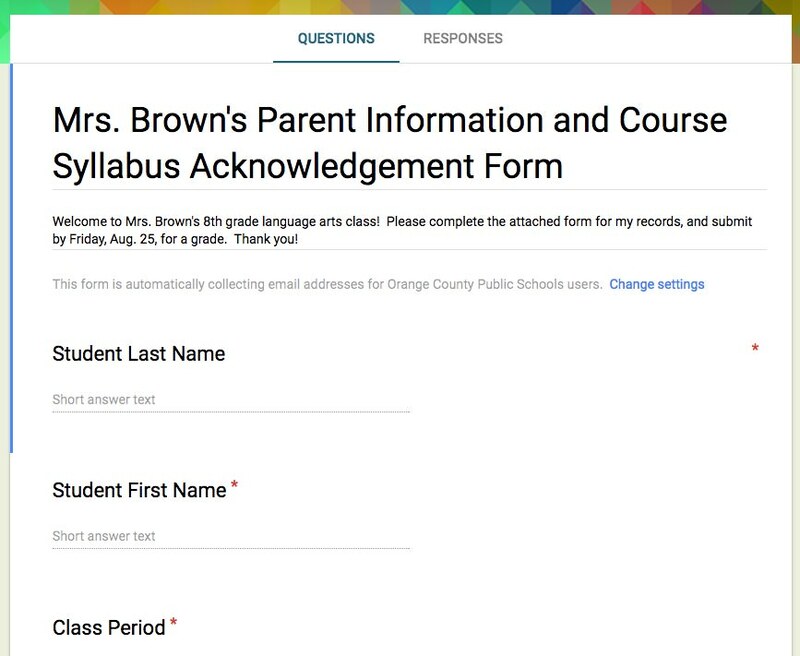 Open a Google form on a classroom computer and have your students submit their information one at a time during the first week of school. Or leave it open on a classroom computer during “Meet the Teacher” or “Open House” for parents to complete. Hope that helps eliminate some of your front-loading of information before you jump into the ClassMax pool. And mark your calendars while you’re at it! SEPTEMBER 5 WE ARE LIVE FOR USE! WHOO HOOOOOOOO!!!!! This entry was posted in Uncategorized and tagged ClassMax, teaching.